It has taken me a moment to create this post. Like millions around the world I was devastated upon hearing of Steve’s death. I will be honest…I cried…hard. Those of you who know me know how I feel about Apple and the mastermind behind so many innovations that drive my passion for better opportunities for our children. What I quickly learned was the Steve wouldn’t want me to be crying…he would want me to press on and continue to be an innovator…a Cre8tiv Mind. He was afraid of death, he actually embraced it. It was in the shadow of death that he was able to fully unleash his creativity for the entire world to see. And we basked in his sunlight and even absorbed much of its goodness. I just want to say thank you Steven P. Jobs for being you. Your boldness has allowed me to confidently be me. 10 Lessons Learned from Steve Jobs. “I didn’t see it then, but it turned out that getting fired from Apple (AAPL) was the best thing that could have ever happened to me. The heaviness of being successful was replaced by the lightness of being a beginner again, less sure about everything. It freed me to enter one of the most creative periods of my life.” Steve Jobs, June 12, 2005. 2. Stay in the game. The real breakthrough moments in Steve’s career happened after 25 years of struggle. “Sometimes when you’re in the middle of one of these crises, you’re not sure you’re going to make it to the other end. But we’ve always made it, and so we have a certain degree of confidence, although sometimes you wonder.” Steve Jobs, March 7, 2008. “I’m convinced that about half of what separates the successful entrepreneurs from the non-successful ones is pure perseverance.” Steve Jobs interview, 1995. 3. Follow your passion wherever it leads. “Being the richest man in the cemetery doesn’t matter to me…Going to bed at night saying we’ve done something wonderful…that’s what matters to me.” Steve Jobs, May 25, 1993. “Almost everything–all external expectations, all pride, all fear of embarrassment or failure–these things just fall away in the face of death, leaving only what is truly important. Remembering that you are going to die is the best way I know to avoid the trap of thinking you have something to lose. You are already naked. There is no reason not to follow your heart.” Steve Jobs, June 12, 2005. “People think focus means saying yes to the thing you’ve got to focus on. But that’s not what it means at all. It means saying no to the hundred other good ideas that there are. You have to pick carefully.” Steve Jobs, June 2003. “I’m as proud of what we don’t do as I am of what we do.” Steve Jobs, February 6, 2006. 6. A master architect builds a platform upon which others are given the capacity to thrive. Apple’s ecosystem and especially its App Store enabled creativity to flourish. 7. Love and passion come first. Everything else will take care of itself. “My job is to make the whole executive team good enough to be successors, so that’s what I try to do.” “When I hire somebody really senior, competence is the ante. They have to be really smart. But the real issue for me is, Are they going to fall in love with Apple? Because if they fall in love with Apple, everything else will take care of itself. They’ll want to do what’s best for Apple, not what’s best for them, what’s best for Steve, or anybody else.” Steve Jobs, March 7, 2008. 8. Too many of us fail to reach our potential because of the bureaucracy that binds us. “Why join the navy if you can be a pirate?” Steve Jobs, September 1982. Steve understands it. “Quality is more important than quantity. One home run is much better than two doubles.” Steve Jobs, February 6, 2006. 10. Progress comes from within. “The cure for Apple is not cost-cutting. The cure for Apple is to innovate its way out of its current predicament.” Steve Jobs, 2004. Ok, ok, ok…we all know about my technolust with apps. Well, today I saw Card Flick and I am loving it. I am always digging in my laptop bag, purse, truck, lipstick case…whatever, for a business card (on a side note I just got a really hot LV card case in an attempt to not lose my cards anymore). Anyway, I am focused again…CardFlick is a new app “coming” to the App Store that will allow you to make your own digital business cards with varying themes and then “flick” them to a nearby person. Check out the vid. You have to go their site: http://cardflick.co and apply to be a Beta user. Click this link here > http://cardflick.co/e75e10 to sign up. The more friends I sign up the quicker we will all flick! I am baaaaccckkk. A new obsession with augmented reality has brought me out of my blog sabbatical. Those of you who know me know what I am about to say…say it with me, “HOTNESS!” Augmented Reality is becoming the hottest technology trend EVER! Let me start with the basics of AR and then scaffold. Augmented reality (AR) is a term for a live direct or an indirect view of a physical, real-world environment whose elements are augmented by computer-generated sensory input, such as sound or graphics. It is related to a more general concept called mediated reality, in which a view of reality is modified (possibly even diminished rather than augmented) by a computer. As a result, the technology functions by enhancing one’s current perception of reality. By contrast, virtual reality replaces the real world with a simulated one. Augmented reality combines a layer of virtualness and combines it with the real world. 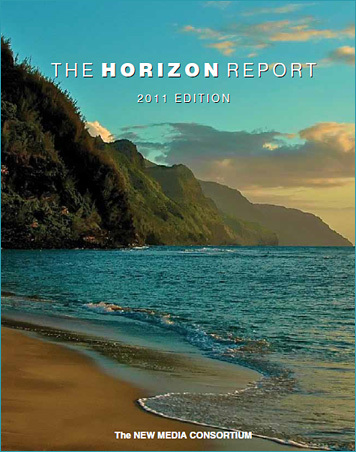 If you haven’t read the 2011 Higher Ed Horizon Report, click HERE and see what it says about AR. Need more? Well, I think an example is necessary to bring this full swing. Take a look at this video from Logical Choice Technologies on their newest product, Letters alive™. 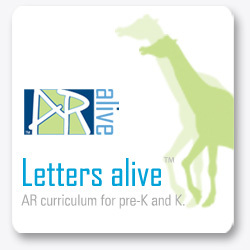 Letters alive™ brings a kingdom of 26 “seemingly-alive” digital 3D animals into classrooms with the ultimate goal of teaching children to read at the kindergarten level. The product consists of a set of 124 virtual 3D cards, software, curriculum guide, and student activity sheets. Take a virtual 3D card and a virtual animal will pop up on your screen. Virtualness + Real World = Augmented Reality. I have been on a world tour showing off AR everywhere I go. Letters alive™ has accompanied me on the journey. Teachers absolutely love it. The features alone draw not only students, but teachers into the content. Learning doesn’t have to be the same drill and kill anymore. Innovation is the key to reviving the same old content. I am very eager to see some data on reading proficiency after a year of Letters alive™ in the classroom. ABOVE: Teachers at the Sumner County Technology Conference in Tennessee lined up to get their chance at using Letters alive™. A teacher from Los Angeles, California at the iSummit Conference in awe of AR. This post is merely the beginning of my AR love affair. Creating an AR in Education website right now! I will be blogging all week about AR and I will provide the different categories of AR, examples via the computer and our beloved mobile devices, examples in education and implications for education. Augmented what? AR technology allows users to view virtual objects overlaid on a real-world context, and to control the virtual environment through direct, tangible interaction with objects tracked in the physical space. An augmented reality environment includes elements of the real world and the virtual world at the same time, but is interactive in real time. The interaction between the virtual object and the real world brings to life abstract concepts and seeks to enhance understanding. Sound interesting? In this session attendees will better understand AR and it implications in education. Learn how to manipulate AR objects via mobile devices and laptops. Discover how AR applications can enhance textbooks too have the power to engage a reader in ways that have never been possible. Take a field trip to a museum with a group of classmates and never leave the classroom. Come learn how to manipulate human organs, make letters come alive, make virtual scavenger hunts and learn how to make your own AR objects: text, photos, sound and more. Using AR applications can provide each student with his/her own unique discovery path. Don’t miss out on all of the fun! Wordia – Brings words to life through the use of video. Encyclomedia – Video encyclopedia where results can be embedded into a site. Zooburst – Great site for for digital storytelling, where a user can make an online 3D pop-up book. Jay Cut – Similar to iMovie that allows users to edit or create a video. Splashup – Looks like Photoshop and is a great way to edit photos and manipulate layers and effects. Comic Master – Fun site for digital storytelling that has a drag-n-drop interface. Knowcase – Create collaborative outlines with this easy-to-use site. Cloud Canvas – Great site for photo editing and drawing or painting, similar to Splashup. Magic Studio – Great multi-media site for uploading photos,documents or video and then editing them. We are Teachers – Social network for educators where lots of ideas and lessons can be found. Where are my friends from Tennessee who joined me at iSummit? I need a firecracker sizzle and pop…join me tomorrow…same time…same place. Hello all…it’s that time. Time to get our web shout outs…on! Drum roll…here goes tonight’s top 10 ten. Cacoo – Nice site for creating online charts and graphs with a built-in chat feature for collaboration. 21 Classes – Get students blogging in a safe and secure environment. Story Jumper -Excellent site for digital storytelling, with many educational resources for teachers. Education Eye – Fun site for brainstorming with this visual search engine. Kizoa – Great site for creating animated slide shows with lots of different content to choose from. Drag on Tape – Very user-friendly site that uses a drag-n-drop interface to edit and mix video. Shwup – Great site for making collaborative slide shows. PreZentit – Very similar to Shwup, a nice looking site for making collaborative slide shows. TodaysMeet – Create a real-time, private, back channel chat that brings in tweets from Twitter. MeMoov – Very user-friendly site for digital storytelling that allows users to record their voice for narration. Hotness! Join me tomorrow…same time…same place. Good evening friends. I am feeling super on fire about technology web resources tonight. Maybe because it is so cold outside I needed to find something that would ignite a little bit of FFFFFIIIIIRRRREEEE inside of me. So, over the next few days I am going to list tons of Web 2.0 educational websites that get my “Hotness” stamp of approval. Let’s go ahead and start this thing off right tonight with my first shout-out of websites. I will do 10 each night…put the hot cocoa down…you won’t need it…HA! Googlios – A way for students to create digital portfolios online using Google Tools. Kidblog – Great way for schools to have kids blog. No student email is required and everything is monitored before being posted online. Middlespot – Innovative website for social bookmarking that allows users to collect sites in a visual way. Vuvox – A new creation platform for WYSIWYG online multimedia layout and sharing. Quietube – “Magically” remove everything except the video from any YouTube page. Share the URL on a web page or via email. Quizlet – Create and share interactive study materials. Keep track of your progress automatically. Google Search Stories – You have seen the video…now create your own. I LOVE THIS SITE!